If you have decided to get a vacuuming robot and you are considering either an iRobot Roomba or Shark ION, you might find this article helpful. We will compare here two excellent and affordable Roomba robots and the top two Shark ION robots. iRobot has produced a number of Roomba robots that range from the most basic to the most sophisticated, the top models being quite expensive. If you don't want to pay the higher prices of the top Roombas, but still want to have a Roomba with a full set of features that will satisfy the cleaning requirements of most homes, you might want to consider Roomba 890 and 690. On the other hand, Shark has more recently entered the robot vacuum cleaners market, and has so far produced only a few robots, the most popular being ION 750 and ION 720. 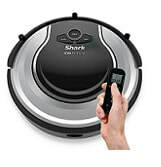 This article will compare Shark ION 750 & Shark ION 720 with iRobot Roomba 890 & iRobot Roomba 690. Otherwise, please read on below for a detailed comparison of the above listed robots. The following table compares the selected robots. With Smart Sensor technology on both Shark ION 750 and 720, these robots can seamlessly navigate bare floors and low-pile carpets, all the while assessing the surroundings thanks to the proximity sensors, and adapting to nearby objects. The low-profile of these robots allow them to easily glide under low lying furniture. In addition, these robots can transition from bare floors to low-pile carpets with ease to provide thorough cleaning throughout the home. iAdapt technology found on Roomba 690 and 890 is composed of sophisticated software as well as sensors, and allows these robots to clean more thoroughly the room, making multiple passes, avoiding stairs, getting under and around furniture, and cleaning along wall edges and corners. The low-profile design of these robots allows cleaning under most furniture. They also automatically adjusts to all floor types - carpet, tile, hardwood, laminate and more. Shark ION 750 and 720 are equipped with a large self-cleaning bristle brush built with helix-pattern high-tensile bristles that provide thorough pickup on carpets and hard floors. The innovative self-cleaning system of the brush lets the brush roll manage and untangle long hair, string, and fibers, so you don't have to remove. Finally, an efficient vacuum pulls dirt and hair off the brushes and directs it into the bin. Roomba 690 is equipped with dual counter-rotating multi-surface brushes. One to loosen dirt and the other to pick it up. The brushes work together to grab and remove dirt, dust, hair, and large debris from your floors. Roomba 890 uses dual counter-rotating multi-surface tangle-free brushes that pick up dirt, dust hair and debris from the floor. These brushes are also known as debris extractors that grab and break down debris, eliminating hair tangles and jams. Both robots use a single spinning side brush that cleans along wall edges. 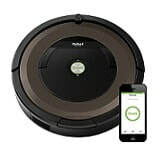 When Shark ION 750, Roomba 890 and Roomba 690 are connected via your home's Wi-Fi to internet, you can use their associated free app for Android and iOS to invoke remotely operations such as cleaning, scheduling, etc. from wherever you are, using your smartphone or tablet. ​Note also that these three Wi‐Fi connected vacuuming robots are compatible with devices that run Amazon Alexa, and therefore they can be voice controlled. Simply ask Alexa to start, stop, or dock your robot. Both Shark ION robots use HEPA type filters. HEPA stands for "high efficiency particulate air" and is a filter grade defined by the US Department of Energy which requires the filter to be able to remove more than 99.97% of particles as small as 0.3 micron. ​​The AeroVac filter used in Roomba 690 handles quite adequately hair, pet fur, lint and carpet fuzz, but not as well as the AeroForce High Efficiency filter found on Roomba 890 that can capture 99% of allergens, pollen, and particles as small as 10 microns. All four robots considered here allow programming of the robot for scheduled cleaning. ​Scheduling can be pre-set up to 7 times per week. The robot starts vacuuming as soon as the scheduled time is reached. When batteries run low, all four robots considered here return by themselves to their Home Base to dock and recharge. The average run time for all four robots is about 60 minutes at full charge. But note that run times can vary extensively depending on the amount of work the robot has to do to clean the floors. That is because different types of carpets, different floor plans and different amounts of dirt may require different amounts of effort from the robot and hence different amounts of ''juice'' from the battery. All four robots considered here allow the spot cleaning function that forces the robot to concentrate on cleaning thoroughly a particularly hard-to-clean spot. Note that all four robots allow this function to be invoked by pressing a button on the robot itself. 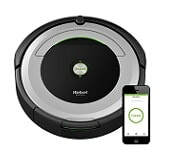 In addition, Shark ION 750, and both Roomba robots considered here, allow invoking this function from your smartphone using the associated app. With Shark ION 720 you can use the Remote-Control device to invoke the spot cleaning function. All four robots considered here come equipped with a Lithium-Ion battery. ​Note that Lithium-Ion batteries provide longer run times than Nickel Metal Hydride (Ni-MH) batteries for a comparable amount of work load, and last longer before needing to be replaced. Shark ION750 and both Roomba robots considered here can be controlled and scheduled remotely from wherever you are, using your smartphone or tablet. Shark ION 720 can only be remotely controlled using the remote-control device it comes with. But note that with a remote-control device, you have to be at close distance from the robot to control it. Navigation control has to do with preventing the robot to enter certain rooms or certain areas in a given room. Both Shark ION robots use BotBoundray Strips that can be stretched across doorways that the robot is not supposed to cross. Both Roomba robots considered here use Dual Mode Virtual Wall Barriers to prevent the robot crossing doorways, but these stand-alone devices can also be used as "Virtual Wall Halos " to protect some restricted area within the room, like for instance the area where the dog food might be. Note that Dual Mode Virtual Mode Barriers require 2 AA batteries that are included in the purchase of the robot. ​BotBoundary Strips are included when you purchase the Shark ION robots. ​Similarly, a single Dual Mode Virtual Wall Barrier is included when you purchase either of the Roomba robots considered here. ​All four robots considered here are equipped with a docking button that can be pressed to force the robot to dock at its Home Base. Of course, the robot will also go automatically to its Home Base when battery runs low. All four robots considered here come with a 1-year limited warranty. ​So which of the four robots should you get for your home? If you need to have a robot that you can control remotely using your smartphone or tablet, from wherever you may be, you should consider either the Shark ION 750, Roomba 890 or Roomba 690. Shark ION 720 does not support Wi-Fi and can only be controlled remotely using the included remote-control device as long as you are not too far. If you want a robot that will deal effectively with accumulated debris, then you should consider Roomba 890 which is equipped with dual brushes, known also as debris extractors, that grab and break down debris eliminating hair tangles and jams. Note however that Shark ION 750 and 720 are also equipped with a self-cleaning brush system that lets the brush roll manage and untangle debris, long hair, string, and fibers, so you don't have to remove. Roomba robots are equipped with double main brushes, while both Shark ION robots are equipped with a single main brush. On the other hand, Shark ION robots are equipped with double spinning side brushes, while the Roomba robots have a single spinning side brush. Also, Shark robots are slightly thinner than the Roomba robots, therefore they can go better under low lying furniture. If you want a robot that indicates when the bin is full, you should consider Roomba 890 as the other three robots have no full bin indicators. In terms of navigation control, both Shark ION robots use BotBoundary Strips that can simply be stretched acrooss a doorway to prevent the robot from entering a room that is not supposed to be cleaned. The BotBoundary strips require no batteries. On the other hand, the Dual Mode Virtual Mode Barriers used by the Roomba robots require 2 AA batteries to run, but they can be used both for blocking the entry way to a room and to protect some restricted area within the room, like for instance the area where the dog food might be. Note that the batteries are included with the purchase. Finally, if you are trying to decide between Roomba 690 and 890, keep in mind that an important difference between these two robots is that Roomba 890 is built with the more powerful AeroForce vacuuming technology that can generate suction power 5 times stronger than the suction power generated by the AeroVac technology used by Roomba 690. Please click the Amazon link image below for the robot of your choice to see exact price information or to purchase.